These Iveco 110-17 4x2 cargo trucks are ideal delivery trucks. They are in good condition being ex military German forces. 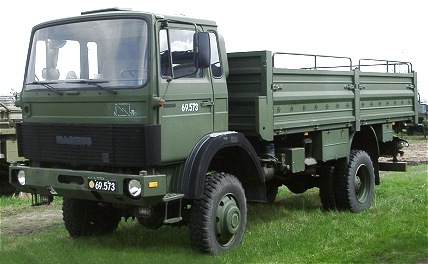 The vehicles use the Deutz air cooled engine and are suited to most situations. Having dual tyres on the rear axle, they can carry up to 5,400kg on road. Length: 7.51 m (292 inches). Width: 2.50 m (97 inches). Height: 3.42 m (133 inches). Weight: 11.800 kg (25.960 lb.). Horsepower: 168 at 2.650 rpm. Transmission: 6-speed S 6-36 gearbox. Electrical system: 24 volt, negative ground. without preparation: 0.8 m (31 inches). Fuel capacity: 200 liter (44 gallons). Range: 300 km (187 miles).